German preparations were now moving fast towards the climax planned for 25–26 August. The complete military subservience of Slovakia was obtained in advance, and the decision to strike on the 26th was confirmed at an OKW conference on the 23rd. Allegations of Polish atrocities against their German minority were increased in number and violence, the old battleship Schleswig-Holstein slid into Danzig harbour on its courtesy visit, and the Greiser-Chodacki customs talks were sabotaged according to Veesenmayer’s plan when Poland was forced by outrageous demands to withdraw from the discussion on the 24th.2 It is unwise to talk simply of ‘inevitable’ wars, and two of the main postulates on which Hitler based his plans were about to be destroyed. On the other hand he was determined and now ready to destroy Poland; his Blitzkrieg preparations, as well as the ‘face’ involved, created a momentum of their own which reinforced his inclination to run whatever risks the use of force entailed; and Poland, a stage in the drive eastwards, was also an adjunct to the decision to turn against the West at a later moment of Germany’s own choosing. 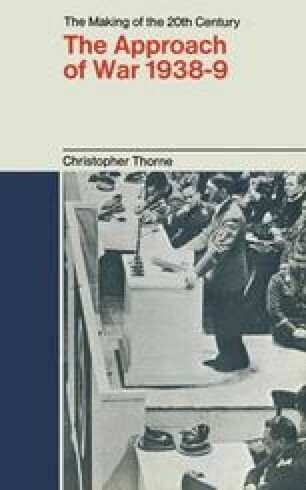 If war within a few years was not ‘inevitable’, Hitler was doing his best to make it so. Les Allemands n’ont donc pas tort, lorsqu’ils prétendent que Dantzig n’est en soi qu’une question secondaire. Ce n’est pas seulement le sort de la Ville Libre, c’est la servitude ou l’independance de l’Europe qui est l’enjeu de la partie actuellement ouverte.